The Allies of World War II, called the United Nations from the 1 January 1942 declaration, were the countries that together opposed the Axis powers during the Second World War (1939–1945). The Allies promoted the alliance as a means to control German, Japanese and Italian aggression. The Lend-Lease policy, formally titled An Act to Promote the Defense of the United States, was an American program to defeat Germany, Japan and Italy by distributing food, oil, and materiel between 1941 and August 1945. The aid went to the United Kingdom, China, and later the Soviet Union, Free France, and other Allied nations. It included warships and warplanes, along with other weaponry. The policy was signed into law on March 11, 1941, and ended overnight without prior warning when the war against Japan ended. The aid was free for all countries, although goods in transit when the program ended were charged for. Some transport ships were returned to the US after the war, but practically all the items sent out were used up or worthless in peacetime. In Reverse Lend Lease, the U.S. was given no-cost leases on army and naval bases in Allied territory during the war, as well as local supplies. The Sherman Firefly was a tank used by the United Kingdom and some Commonwealth and Allied armoured formations in the Second World War. It was based on the US M4 Sherman, but fitted with the powerful 3-inch (76.2 mm) calibre British 17-pounder anti-tank gun as its main weapon. Originally conceived as a stopgap until future British tank designs came into service, the Sherman Firefly became the most common vehicle mounting the 17-pounder in the war. Sir Henry Thomas Tizard was an English chemist, inventor and Rector of Imperial College, who developed the modern "octane rating" used to classify petrol, helped develop radar in World War II, and led the first serious studies of UFOs. Operation Sea Lion, also written as Operation Sealion, was Nazi Germany's code name for the plan for an invasion of the United Kingdom during the Battle of Britain in the Second World War. Following the Fall of France, Adolf Hitler, the German Führer and Supreme Commander of the Armed Forces, hoped the British government would seek a peace agreement and he reluctantly considered invasion only as a last resort if all other options failed. As a precondition, he specified the achievement of both air and naval superiority over the English Channel and the proposed landing sites, but the German forces did not achieve either at any point during the war, and both the German High Command and Hitler himself had serious doubts about the prospects for success. A large number of barges were gathered together on the Channel coast, but, with air losses increasing, Hitler postponed Sea Lion indefinitely on 17 September 1940 and it was never put into action. The Tizard Mission, officially the British Technical and Scientific Mission, was a British delegation that visited the United States during the Second World War in order to obtain the industrial resources to exploit the military potential of the research and development (R&D) work completed by the UK up to the beginning of World War II, but that Britain itself could not exploit due to the immediate requirements of war-related production. It received its popular name from the program's instigator, Henry Tizard. Tizard was a British scientist and chairman of the Aeronautical Research Committee, which had propelled the development of radar. Small arms began to be shared after the fall of France, most of the 'sharing' being one sided as America was not yet directly involved in the conflict and thus all the movement was from the United States to the United Kingdom. In the months following Operation Dynamo, as British manufacturers progressed in building replacements for the materiel lost by the British Army in France, the British government looked overseas for additional sources of equipment to assist in overcoming shortages and prepare for future offensives. The most extreme example of the shortages were found in the quickly improvised Local Defence Volunteers, later renamed the Home Guard, who were forced to train with broom handles and makeshift pikes using lengths of piping and old bayonets until weapons could be supplied. Materiel, refers to supplies, equipment, and weapons in military supply chain management, and typically supplies and equipment only in a commercial supply chain context. The British Army is the principal land warfare force of the United Kingdom, a part of British Armed Forces. As of 2018, the British Army comprises just over 81,500 trained regular (full-time) personnel and just over 27,000 trained reserve (part-time) personnel. The Thompson submachine gun is an American submachine gun invented by John T. Thompson in 1918 which became infamous during the Prohibition era, being a signature weapon of various crime syndicates in the United States. It was a common sight in the media of the time, being used by both law enforcement officers and criminals. The Thompson submachine gun was also known informally as the "Tommy Gun", "Annihilator", "Chicago Typewriter", "Chicago Piano", "Chicago Style", "Chicago Organ Grinder", "Trench Broom", "Trench Sweeper", "The Chopper", and simply "The Thompson". The M1917 Revolvers were six-shot, .45 ACP, large frame revolvers adopted by the United States Military in 1917, to supplement the standard .45 ACP M1911 pistol during World War I. There were two variations of the M1917, one made by Colt and the other made by Smith & Wesson. They used moon-clips to hold the rimless cartridges in position and to aid in extraction. After World War I, they gained a strong following among civilian shooters. A commercial rimmed cartridge, the .45 Auto Rim, was also developed, that allowed them to be fired without the need for moon-clips. Later, the M1919 .30 machine gun and the M2HB .50 machine gun chambered in .50 BMG were provided by the U.S. for infantry and anti-aircraft use. Browning AN2 light machine guns in .303 British caliber were already in use standard fitment on British aircraft beginning in the late 1930s. The M1919 Browning is a .30 caliber medium machine gun that was widely used during the 20th century, especially during World War II, the Korean War, and the Vietnam War. The M1919 saw service as a light infantry, coaxial, mounted, aircraft, and anti-aircraft machine gun by the U.S. and many other countries. Many M1919s were rechambered for the new 7.62×51mm NATO round and remain in service to this day. The .50 Browning Machine Gun is a cartridge developed for the Browning .50 caliber machine gun in the late 1910s, entering official service in 1921. Under STANAG 4383, it is a standard cartridge for NATO forces as well as many non-NATO countries. 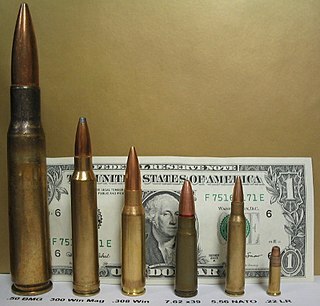 The cartridge itself has been made in many variants: multiple generations of regular ball, tracer, armor-piercing (AP), incendiary, and saboted sub-caliber rounds. The rounds intended for machine guns are made into a continuous belt using metallic links. Britain supplied small arms to the USSR, and the 9mm Sten submachine gun was supplied to Soviet partisan troops. The STEN was a family of British submachine guns chambered in 9×19mm and used extensively by British and Commonwealth forces throughout World War II and the Korean War. They had a simple design and very low production cost, so they were also effective insurgency weapons for resistance groups. The British made use of many American towed artillery pieces during the war, such as the M2 105 mm howitzers, M1A1 75mm Pack Howitzers, 155 mm guns (Long Toms). These weapons were supplied under Lend-Lease or bought outright. Tank/tank destroyer guns used by the British included the 37 mm M5/M6 Gun (General Stuart and General Grant/Lee tanks), 75mm M2 Gun (General Grant/Lee), 75 mm M3 Gun (General Grant/Lee and General Sherman), 76 mm Gun M1 (General Sherman) and 3" Gun M7 (3in SP M10). The Americans in turn used a British artillery piece, the Ordnance QF 6-pounder 7cwt anti-tank gun. The US realized at the start of the war that their own 37 mm Gun M3 would soon be obsolete and thus they produced a license built version of the QF 6-pounder under the designation 57 mm Gun M1. Both 76 mm and 75 mm guns were mounted on tanks sent to the Soviets by the US, while the British tanks sent were armed with both the Ordnance QF 2-pounder and the Ordnance QF 6-pounder. 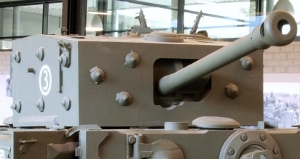 The Medium Tank M4 was used in all theatres of the Second World War. It had a versatile reliable design and was easy to produce, thus huge numbers were made and provided to both Britain and the USSR by the United States under Lend-Lease. Despite official opinions, the Medium Tank M4 was well liked by some Soviet tankers, while others called it the best tank for peacetime service. When Britain received the tank, it was given the designation Sherman, which gave rise to the name Sherman tank and the UK naming its US-built tanks after American Civil War generals. Both the British and the Soviets re-armed their M4s with their own tank guns. The Soviets re-armed a small number with the standard 76 mm F-34 tank gun but so much 75 mm ammunition was supplied by the US that the conversions were not widespread. Unfortunately, the fairly short-barreled 75mm gun most Shermans came equipped with did not offer very good armor penetration even with specialty ammunition, especially against the then-new Panther and Tiger. However, the British 76.2mm (3-inch) Ordnance QF 17-pounder, one of the best anti-tank guns of the period, happened to fit in the Sherman's turret quite well with a new gun mantlet and sight, and this became a very common modification known as the Firefly. The other main modification was that the radio moved to an armoured box welded to the turret bustle, which also contained the much larger counterweight for the new gun. The combination of British and American weaponry proved desirable, although despite the United States building a few 17-pounder Fireflies from new, it never went into mass production and did not see action. The US had its own 76 mm calibre long-barrel gun for the Sherman. While it wasn't as good as the 17-pounder, it still had a much better chance of successfully engaging German heavy tanks especially at close range, offered consistent kill-power against more equally-matched opponents at all ranges, and didn't require major modification to fit like the 17-pounder did. The Firefly thus remained a British variant of the Sherman. The M10 Tank Destroyer was also up-gunned with the 17-pounder, creating the M10C tank destroyer. This was used in accordance with British tactical doctrine for tank destroyers, in that they were considered self-propelled anti-tank guns rather than aggressive 'tank hunters'. Used in this fashion, it proved an effective weapon. 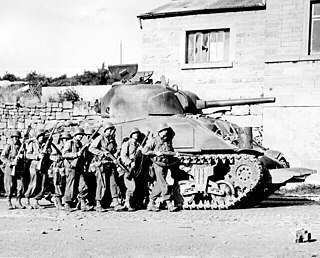 The British also used the Sherman hull for two other Sherman variants known as the Crab, a mine flailing tank, and the DD Sherman, the 'DD' standing for Duplex Drive. The DD was an amphibious tank. A flotation screen gave buoyancy and two propellers powered by the tank's engine gave propulsion in the water. On reaching land the screens could be dropped and the tank could fight in the normal manner. The DD, another key example of combining technologies, was used by both British and American forces during Operation Overlord. The DD had impressed US General Dwight D. Eisenhower during demonstrations and was readily accepted by the Americans. The Americans did not accept the Sherman Crab, which could have assisted combat engineers with clearing mines under fire, protected by armour. Armoured recovery vehicles (ARVs) were also converted from Shermans by the British as well as the specialist BARV (Beach Armoured Recovery Vehicle) designed to push-off landing craft and salvage vehicles which would otherwise have been lost. Deliveries of M3 Half-tracks from the US to the Soviet Union were a significant benefit to mechanized Red Army units. Soviet industry produced few armoured personnel carriers, so Lend-Lease American vehicles were in great demand for fast movement of troops in front-line conditions. While M3s had only limited protection, common trucks had no protection at all. In addition, a large part of the Red Army truck fleet was American Studebakers, which were highly regarded by Soviet drivers. After the war, Soviet designers paid a lot of attention to create their own 6x6 army truck and the Studebaker was the template for this development. Britain supplied Hawker Hurricanes to the Soviet Union early in the Great Patriotic War to help equip the Soviet Air Force against the then technologically superior Luftwaffe. British RAF engineer Frank Whittle travelled to the US in 1942 to help General Electric start jet engine production. The American P-51 Mustang was originally designed to a British specification for use by the Royal Air Force and entered service with them in 1942, and later versions were built with a Rolls-Royce Merlin aero-engine. This engine was being produced in the United States by Packard as the Packard Merlin. In addition to the British making use of American planes the US also made use of some Supermarine Spitfires based in the UK and Mediterranean, as well as using Bristol Beaufighter night fighters in the Mediterranean, and de Havilland Mosquitoes based in the UK. The United States supplied several aircraft types to both the Royal Navy and RAF - all three of the U.S. Navy's primary fighters during the war years, the Wildcat, Corsair (with the RN assisting the Americans with preparing the Corsair for U.S. naval carrier service by 1944), and Hellcat also served with the RN's Fleet Air Arm, with the Royal Air Force using a wide range of USAAF types. A wide range of American aircraft designs also went to the Soviet Union's VVS air arm through Lend-Lease, primarily fighters like the P-39 and P-63 used for aerial combat, along with attack and medium bombers like the A-20 and the B-25 being among the more prominent types, both bombers being well suited to the type of lower-altitude strike missions the Soviets had as a top priority. In 1942, and with the threat of invasion by Germany still apparent, the United Kingdom dispatched around 20 British scientists and technical staff to America, along with their work, which had been carried out under the codename Tube Alloys , to prevent the potential for vital information falling into enemy hands. The scientists joined the Manhattan Project at Los Alamos, New Mexico, where their work on uranium enrichment was instrumental in jump-starting the project. This collaboration eventually led to the Mutual Defence Agreement between the two nations, whereby American nuclear weapons technology was adapted for British use. Considerable information was transmitted from the UK to the US during and after WWII relating to code-breaking methods, the codes themselves, cryptoanalyst visits, mechanical and digital devices for speeding code-breaking, etc. When the Atlantic convoys of war material from the US to the UK came under serious threat from U-boats, considerable encouragement and practical help was given by the US to accelerate the development of code-breaking machines. Subsequent co-operation led to significant success in Australia and the far East for breaking encrypted Japanese messages. Other technologies developed by the British and shared with the Americans and other Allies include ASDIC (sonar), the Bailey bridge, gyro gunsight, jet engine, Liberty ship, RDX, Rhino tank, Torpex, traveling-wave tube, proximity fuze. Technologies developed by the Americans and shared with the British and Allies include the bazooka, LVT, DUKW, Fido (acoustic torpedo). Canada and the U.S. independently developed and shared the walkie-talkie. A tank destroyer or tank hunter is a type of armoured fighting vehicle, armed with a direct-fire artillery gun or missile launcher, with limited operational capacities and designed specifically to engage enemy tanks. The M4 Sherman, officially Medium Tank, M4, was the most widely used medium tank by the United States and Western Allies in World War II. The M4 Sherman proved to be reliable, relatively cheap to produce, and available in great numbers. Thousands were distributed through the Lend-Lease program to the British Commonwealth and Soviet Union. The tank was named by the British for the American Civil War general William Tecumseh Sherman. The Comet tank or Tank, Cruiser, Comet I (A34) was a British cruiser tank that first saw use near the end of World War II. It was designed as an improvement on the earlier Cromwell tank, mounting the new 77 mm HV gun in a new lower profile and part-cast turret. This gun was effective against late-war German tanks, including the Panther at medium range, and occasionally, at close range, the Tiger. The tank was widely respected as one of the best British tanks of the war, and continued in service afterwards. The Self Propelled 17pdr, Valentine, Mk I, Archer was a British self propelled anti-tank gun of the Second World War based on the Valentine infantry tank chassis fitted with an Ordnance QF 17 pounder gun. Designed and manufactured by Vickers-Armstrongs, 655 were produced between March 1943 and May 1945. It was used in North-West Europe and Italy during the war; post-war, it served with the Egyptian Army. This vehicle was unique in that its gun faced the rear of the chassis instead of the front. The Tank, Cruiser, Challenger (A30) was a British tank of World War II. It mounted the QF 17-pounder anti-tank gun on a chassis derived from the Cromwell tank to add anti-tank firepower to the cruiser tank units. The design compromises made in fitting the large gun onto the Cromwell chassis resulted in a tank with a powerful weapon and reduced armour. The extemporised 17-pounder Sherman Firefly conversion of the US-supplied Sherman was easier to produce and, with delays in production, only 200 Challengers were built. The Challenger was able to keep up with the fast Cromwell tank and was used with them. The Ordnance Quick-Firing 17-pounder was a 76.2 mm (3 inch) gun developed by the United Kingdom during World War II. It was used as an anti-tank gun on its own carriage, as well as equipping a number of British tanks. Used with the APDS shot, it was capable of defeating all but the thickest armour on German tanks. It was used to 'up-gun' some foreign-built vehicles in British service, notably to produce the Sherman Firefly variant of the US M4 Sherman tank, giving British tank units the ability to hold their own against their German counterparts. In the anti-tank role, it was replaced after the war by the 120 mm BAT recoilless rifle. As a tank gun, it was succeeded by the 84 mm 20 pounder. The Ordnance Quick-Firing 6-pounder 7 cwt, or just 6 pounder, was a British 57 mm gun, serving as a primary anti-tank gun of the British Army during World War II, as well as the main armament for a number of armoured fighting vehicles. The QF 3.7-inch AA was Britain's primary heavy anti-aircraft gun during World War II. It was roughly the equivalent of the German 88 mm FlaK and American 90 mm, but with a slightly larger calibre of 94 mm. Production began in 1937 and it was used throughout World War II in all theatres except the Eastern Front. It remained in use after the war until AA guns were replaced by guided missiles beginning in 1957. The Ordnance QF 75 mm, abbreviated to OQF 75 mm, was a British tank-gun of the Second World War. It was obtained by boring out the Ordnance QF 6 pounder 57-mm anti-tank gun to 75-mm, to give better performance against infantry targets in a similar fashion to the 75mm M3 gun fitted to the American Sherman tank. The QF came from "quick-firing", referring to the use of ammunition with the shell and propellant in a single cartridge. The gun was also sometimes known as ROQF from Royal Ordnance Quick-Firing. The M4 Sherman tank was produced in several variants and it was also the basis for a number of related vehicles. In addition, Shermans have been modified by several nations from modernization upgrades to complete hull conversions for another task. Tanks were an important weapons system in World War II. Even though tanks in the inter-war years were the subject of widespread research, production was limited to relatively small numbers in a few countries. However, during World War II most armies employed tanks, and production levels reached thousands each month. Tank usage, doctrine and production varied widely among the combatant nations. By war's end, a consensus was emerging regarding tank doctrine and design. 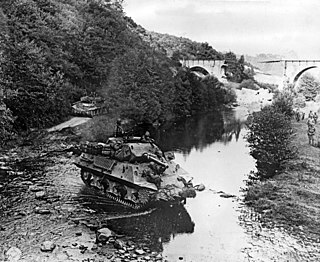 The United States provided tens of thousands of its Medium Tank M4, also named the Sherman, to many of its Allies during the Second World War, under the terms of Lend-Lease. The Ordnance QF 95-mm howitzer was a British howitzer built in two versions during the Second World War. The tank howitzer version was accepted for service use, but the infantry version was not. American military technologies developed during World War II became more advanced and specialized as the war progressed. The technologies produced ranged in complexity from relatively simple items such as small arms and armored vehicles, including tanks, to more complex items such as the atomic bomb. The latter, produced under the secretive Manhattan Project, proved to be an incredibly powerful weapon that revolutionized warfare and was used to end the war. Other technologies, such as the M4 Sherman tank, the M1 Garand and M1 Carbine, and the gas mask, were refinements on previously existing technologies. The T48 57 mm Gun Motor Carriage was a self-propelled anti-tank gun produced by the Diamond T company in 1943 for the United States. The design incorporated a 57 mm gun M1, a US production of the British Ordnance QF 6 pounder, mounted on an M3 Half-track. This article on military tanks deals with the history and development of Canadian tanks: their origin during World War I; the interwar period; World War II; the Cold War; and the modern era. ↑ Roberts, Eric (16 March 2004). "British Technology and the Second World War". Stanford University. Retrieved 26 April 2015. ↑ James W. Brennan, "The Proximity Fuze: Whose Brainchild?," U.S. Naval Institute Proceedings (1968) 94#9 pp 72–78. ↑ Septimus H. Paul (2000). Nuclear Rivals: Anglo-American Atomic Relations, 1941–1952. Ohio State U.P. pp. 1–5. ↑ James Phinney Baxter III (Official Historian of the Office of Scientific Research and Development), Scientists Against Time (Boston: Little, Brown, and Co., 1946), page 142. ↑ Baldwin, Ralph B. The Deadly Fuze: Secret Weapon of World War II, pp. 4-6, 11, 50, 279, Presidio Press, San Rafael, California, 1980. ISBN 978-0-89141-087-4. ↑ Angela Hind (February 5, 2007). "Briefcase 'that changed the world'". BBC News. Retrieved 2007-08-16. ↑ Harford, Tim (9 October 2017). "How the search for a 'death ray' led to radar". BBC World Service. Retrieved 9 October 2017. But by 1940, it was the British who had made a spectacular breakthrough: the resonant cavity magnetron, a radar transmitter far more powerful than its predecessors.... The magnetron stunned the Americans. Their research was years off the pace.